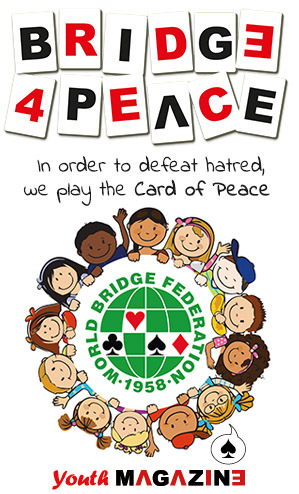 The 1st Yeh Online Bridge World Cup took place from 31 October to 2 November 2016 under the auspices of the World Bridge Federation. This Mixed Teams event was the first live online Bridge Show, featuring the greatest champions and biggest personalities associated with the game. A top class team of commentators analyzed the deals for the watching online spectators. Team EUROPE-LAVAZZA (based in Turin at the headquarters of Lavazza) included the women who currently hold the top two positions in the world rankings, Sylvie Willard and Benedicte Cronier, alongside Maria Teresa Lavazza, Norberto Bocchi, Giorgio Duboin, Agustin Madala and Emanuela Lavazza. Team USA-BBO (based in Seattle) was composed by Bob Hamman (the all time number 1 in the world rankings) playing with Jill Meyers (number 2 on the all time women’s list) Fred Gitelman & Sheri Winestock and Bill Gates and Sharon Osberg. Team CCBA (based in Beijing) comprised Mr Zeng Peiyan, former vice premier for economy & General secretary of the Asian Economic Forum, Mr Guo Jinlong, former Mayor of Beijing plus Chinese World Champions: Gu Ling, Sun Shaolin, Zhang Bangxiang, Li Jianwei. Team CHEN YEH (also playing in Beijing) included Mr Chen Yeh who was joined by World Champions: Shih Juei-Yu, Chen Dawei, Sun Ming, Zhang Ya-lan, Wang Ping. At each venue, remotely controlled webcams monitored each player, streaming live images across the Internet. The best bridge journalists from around the world covered the event with voice and written commentaries and there was instant Daily Bulletin online. Social media were utilised to the fullest extent with dedicated accounts on Facebook, Twitter and Instagram. The winner of the 1st Yeh Online Bridge World Cup officially was the Europe-Lavazza team, but with such a great media coverage, the real winner is the game of Bridge!